3 Red Hearts Dash Cellophane Roll 24 inches wide x 50 ft long. Pretty red hearts with two pink lines under each set of 3. Cello background is clear. 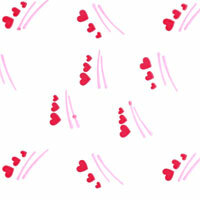 This design is pretty for Valentine's Day or any day to celebrate love with hearts. Our cellophane is high quality and makes beautiful wrapping for gift baskets and packages. For a different look, wrap your gift in solid color tissue paper gift wrap first, then cover with any of the cellophane printed design rolls. What a neat way to wrap a gift package.